The clustering of risk among banks we discussed earlier is still holding. JPM and Citi span the risk range with two risk clusters falling within the range. The range is now wider, approaching 400 bp. The overall spreads have backed up as credit in general is selling off after an unprecedented rally. TARP banks are viewed now as being riskier. Morgan Stanley vs. BofA is a good example. 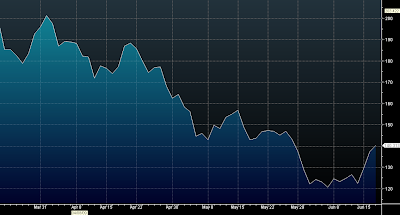 MS CDS was wider than BofA prior to TARP repayment. Now it's the opposite. 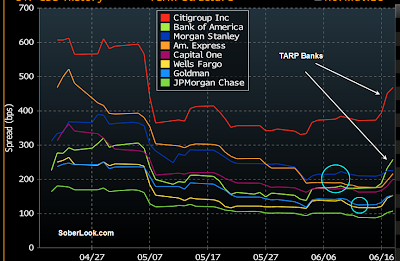 One could argue that's due to current TARP banks being weaker to begin with. But they are now capitalized as well as the non-TARP banks as return of TARP money reduced capitalization. So it's not the capitalization (strength) issue. It may be due to asset quality. That's tough to argue as well as Wells and Capital One have some ugly portfolios for example. Or maybe the market views TARP restrictions as adding risk to the banks. Is TARP viewed as potentially cutting profitability, adding risk of loss of talent, restricting certain businesses? Is TARP associated with potential loss of clients? If a bank can't organize a golf outing for key clients, would that be viewed as a potential hit to performance (particularly when competition has none of these restrictions)? The market is saying yes.